The credit for so many Instant messaging apps goes to whatsapp which is so popular nowadays that people are inspired from it and have come up with better Instant Messaging apps not only with the option to call or send better emojis but also with the option to send a 521 bit ECDH encrypted message. After whatsap’s buyout we have many reasons to replace whatsapp, the main being security. We send our valuable and personal information to our colleges, friends, families which can’t be said to be secure anymore as whatsapp’s in facebook’s hand now. You should consider replacing it if you share vulnerable information with anyone. Out of all instant messaging apps here you are going to find the ones which provide end to end encryption and are no less than whatsapp, you can also check our article to run two whatsapp account on your android phone. No doubt this was going to be the first in the list after getting more than 4million registrations just after facebook-whatsapp deal. This is a free app unlike whatsapp it doesn’t even require any registration and can be used across devices from same account. The killer “secret chat” feature destroys every message after the conversation leaving no trace at all. About the encryption, company has stated here "We support two layers of secure encryption (server-client and client-client). Our encryption is based on 256-bit symmetric AES encryption, RSA 2048 encryption and Diffie–Hellman secure key exchange." Not only this but company is also offering $200,000 bitcoins to the cracker of this encryption. Using two whatsapp accounts? With this app you can officially have multiply identities on a device. The best feature which I like the most apart from the ability to share a lot of stuff like audio clips and videos is the ability to delete a message send by you on your device and get it deleted on recipient’s device too at the same time. It also offer top-notch end-to-end encryption with 256 bit AES-GCM encryption using keys created with 521 bit ECDH. Yes! BBM is a very secure instant messaging platform which not only provides security but also privacy. A platform where I can even send my tatkal booking details to just copy paste on the website. The best part of all, I can share anything with the help of BBM no matter whether it’s a .exe file or a .psd file or even .dll file, not to worry about the extension anymore! 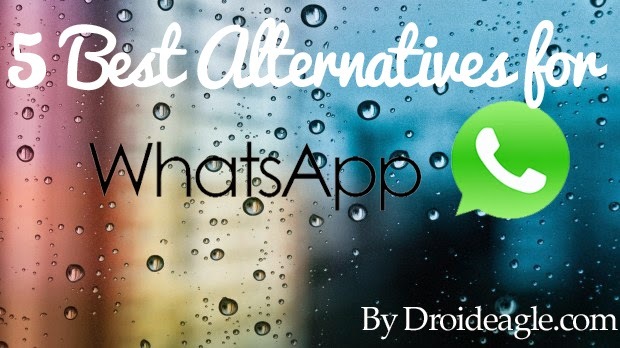 I hope you like our article on Whatsapp Alternatives, You can also all these apps on your PC using Blustacks, If you have any query or doubt than you can directly ask to me via below comment box.